cognitive search: The search result is based on the actual content of the image not the file name. With an ever increasing number of mail accounts, online storage services , personal computing devices, a common user feels overwhelmed with the sheer quantity of files. So it is quite understandable to expect the user to have a central search/content pulling app at his beck and call. The app must be his personal service agent capable of pulling files/documents from across all the users mail & storage accounts. It should also be able to recognize other devices used by the user and fetch files from them as well. More like a Go-getter who never fails you !!! Go-getter is a multi device / platform search application, which takes a search string from the user and searches for that file in his mail accounts (Gmail) , online storage accounts (GoogleDrive), and desktop systems (multiple PCs connected within the same network belonging to the user). Whats more.. this guys is a real Go-getter. Using Cognitive service provided by Microsoft Azure, the app fetches images that are contextually related to the search query. It also performs cognitive text processing on mail contents and returns mails that are more relevant to the given search query. Time was one of the biggest challenger but also the best motivator. Typical Gmail content is quite huge for the indexing hence the app heavily depends on Azure, rather than API pulling. Security, Discovery of nodes, cognitive search, meaningful information retrieval were few other notable challenges. It is an end-to-end working model with multiple functionalities. The design discussions we had were pretty intense and taught us a lot. We did a lot of this which were out of our comfort zone which we enjoyed a lot. The end product that we built is a beast in growing. He is a Go-getter.. he has big dreams. Future scope includes intelligent and fast text processing using NLP. Cognitive capabilities of the app is not restricted to just mails and images, it will be extended to context retrieval across all file formats. Support will be extended to Hotmail, OneDrive , DropBox and any other custom file storage services ( that opens API support). Potential migration to cloud in cases where indexies grow large for any single device to store. I mostly worked on the backend of the master, developing the communication protocol, defining and developing the data storage layer and collaborating in the integration with google drive and mail. I also worked on the html, css and js of the tiny frontend that we built. As a backend guy, I found working on the html and js part interesting. Also as I have not worked on the peer to peer distributed applications much, this was a very good experience in developing seamless peer to peer application. I faced a different set of problems in the situation which was challenging. I worked on Gmail and Google drive file syncing on the master. The file pulling, API backend and OAUTH2 implementations were my primary contribution. The future scope of extending the app to multiple mailing / file storage service can be built on top of this work. Although I have worked on REST API, in this hackathon, working on two different API systems whilst adhering to the design principles and underlying Master-Slave architecture of the App was quite challenging. 2. 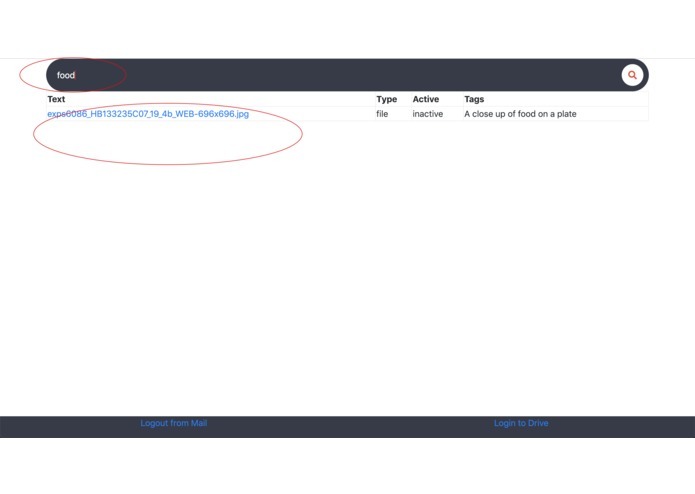 Azure Vision API for adding meta data for image. 3. Azure text API for reducing the index type.